Our Locations subnav-open Created with Sketch. subnav-close Created with Sketch. This fall, the Clancy & Theys team at the Peace development project in Raleigh mentored two students from nearby NC State University. Both students are studying engineering and are interested in construction technology. Saurabh Raka, a graduate student studying construction engineering, and Steffen Schilstra, a senior studying civil and structural engineering, are both in Dr. Kevin Han’s Building Information Modeling in Construction class. Each student in Dr. Han’s class is assigned to a local jobsite, where they observe construction progress, interact with the project and virtual design teams, and submit weekly construction progress reports using visual data and BIM technology to their instructor. 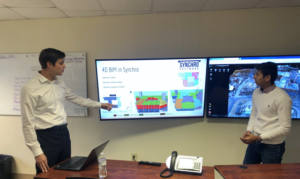 At the culmination of the course, students will conduct a case study using a new BIM-related technology, which will serve as their final project. Dr. Han hopes this experience teaches the students the value of communication on the jobsite and gives them an opportunity to see how construction professionals exchange information about a project. By working closely with the project team, Saurabh and Steffen had the opportunity to gain hands-on experience with construction technology before they begin their careers. Learn more about Clancy & Theys’ virtual design & construction services here. © 2019 Copyright Clancy & Theys. All Rights Reserved. Website Design and Development by NMC.